“Arap Demokrasilerinin Zayıf Temelleri,” Optimist, Kasım 2012, 92-93. “The Economic Roots of Political Underdevelopment in the Middle East: A Historical Perspective.” Southern Economic Journal, 78 (2012): 1086-95. Turkish translation by Gözde Soykan: “Ortadoğu’daki Politik Başarısızlıkların Ekonomik Kökenleri: Tarihsel Bir Perspektif,” Journal of Economics and Political Economy, 1 (September 2014): 68-76. 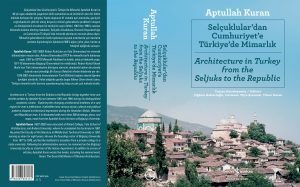 Aptullah Kuran, Selçuklular’dan Cumhuriyet’e Türkiye’de Mimarlık / Architecture in Turkey from the Seljuks to the Republic, ed. by Çiğdem Kafesçioğlu, Lucienne Thys-Şenocak and Timur Kuran (İş Bank Publications, 2012), 788 pp. Table of contents + preface by Timur Kuran + Introduction by Çiğdem Kafesçioğlu and Lucienne Thys-Şenocak. 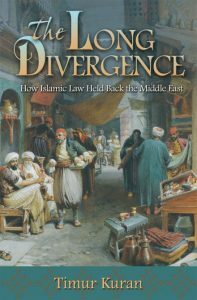 The Long Divergence: How Islamic Law Held Back the Middle East (Princeton: Princeton University Press, 2011). The Long Divergence on Facebook. Read reviews. Turkish edition: Yollar Ayrılırken: Ortadoğu’nun Geri Kalma Sürecinde İslam Hukukunun Rolü (Yapı Kredi Yayınları, 2012). See table of contents + introduction + chapter 1. See the book’s page at YKY. Spanish edition: La Larga Divergencia: La Influencia de la ley Islamica en el Atraso de Oriento Medio (Granada: Editorial Universidad de Granada, 2017). See book’s page at EUG and summary.